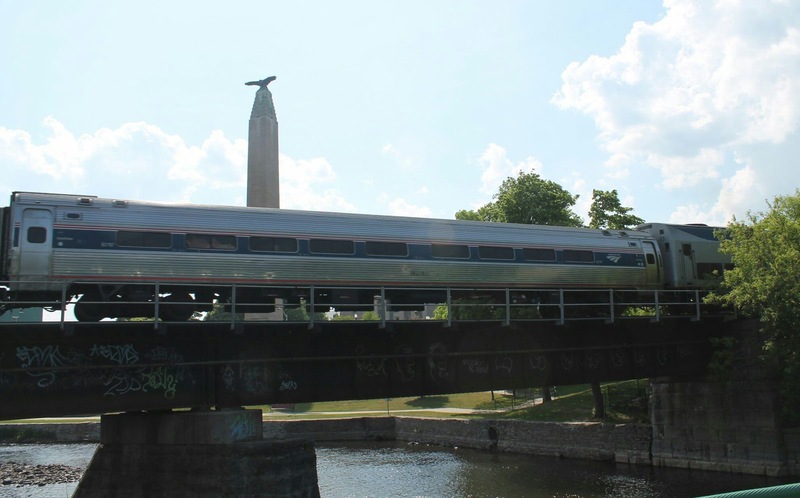 Champlain Valley Rail Snapshots is dedicated to railroad news and happenings in Upstate New York, the Adirondacks and North Western Vermont. I strive to keep updated on train movements, maintenance projects and railroad history and heritage. Join me as we witness the evolving nature on the local Canadian Pacific mainline on the historic Delaware & Hudson bridge line! The railroad industry has a fascinating heritage, and the modern railroad is a miracle of technology and human labor. Well one of the treats of railfanning, seeing a special or heritage engine, has been the norm again in upstate New York (hint Northern New York) with the Amtrak 145 running back and forth on the Adirondack. We've had several opportunities to see this heritage engine, painted in Phase III livery for the Amtrak 40th anniversary. Yesterday was the first chance I got to chase it though, and another dreary cloudy day it was. However the sun came out for some remarkable views at Wickham Marsh near Port Kent, NY. One bug was that while trying to update the locations for HeritageUnits.com using the Android app, my phones GPS kept going wonky and messed up on of my locations, and after that I pretty much had to put my location in on manual, combine that with the frustrating Internet situation with the mountains, and it was almost better off leaving technology in the past! We sighted it first at Wickham Marsh, in Port Kent; Essex Rd. (Rt. 22) Crossing in Essex, NY; Port Henry coming out of the station; and Ticonderoga at Montcalm's Landing. As a bonus we saw the local, D13 passing through the Ticonderoga station with a double head of GP20ECO units. Fort Ticonderoga in the distance at 3:54 pm. trail zealots gleefully insult and slander train enthusiasts because of our hobby. Other news coming up is that Toys for Tots train this weekend. Here is the schedule which I am hoping to catch at a number of different locations, and as cell service holds up, look for me to live stream the action at Rouses Point. the U.S. at 1:09 am. 11/(25/26)/2016 A small group of stalwart rail enthusiasts await the appearance of this years Canadian Pacific Holiday Train. This wonderful corporate ambassador is now in its 18th year. If it were a person it would already have learned to drive, vote for parliamentarians, registered for the draft (does Canada have selected service?) and start paying taxes. Not that corporations do all that stuff, especially the last one. But the Holiday Train is a time to set aside those squabbles, and wonder and awe at the dazzling display and the talented performers, and hopefully think of our fellow man. One of the great accomplishments of the train is how they collect food and donations for local food shelves, and raise awareness for healthy living. Despite what must be an extraordinary cost associated with putting together and running two of these trains around North America, Canadian Pacific, whose heritage goes back to the 1880's and the goal of creating Canada's first transcontinental railroad, has done so for 18 years, and hopefully for many more. 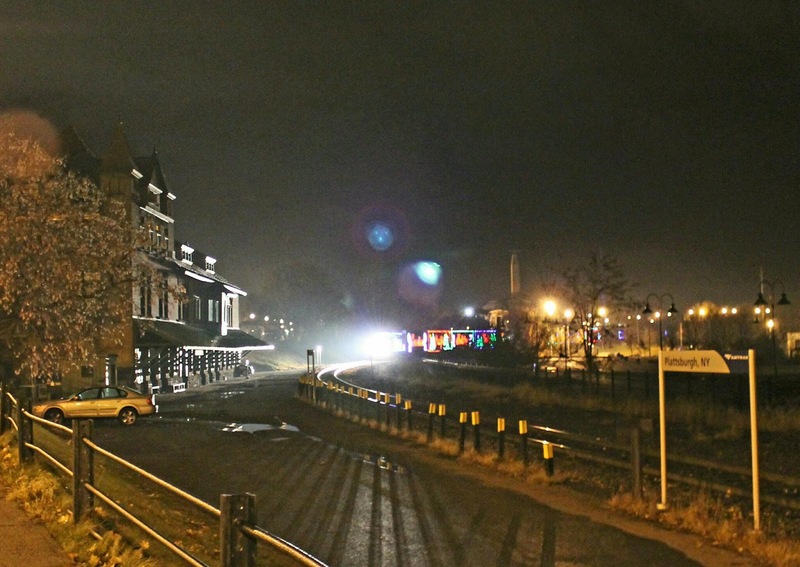 So back to our story, a small group of rail enthusiasts (railfans if you will) gather near Plattsburgh New York's own historic 1800's Delaware & Hudson train station awaiting the Holiday Trains appearance on a dead head move South to Albany. They have finished doing shows in Southern Quebec and now have to move South to run North for shows on Saturday and Sunday. Generally by the time it runs through Plattsburgh it is after midnight. It depends when the last show was, how much other traffic there is, and how long it takes to get through the border. Tonight there were two Northbound trains on the agenda to work around. So first we were greeted by a CP253, a Northbound manifest freight just about midnight, that was lead by usual GE road power, but the trailing unit was a surprise sighting of a CP EMD SD40-2 the 5833, recently pulled out of mothball for the upswing in traffic. We heard on the radio that there was a Northbound 931 about a Norfolk Southern/ Canadian National run through that comes up the CP. It got told to wait at Bluff for Santa Claus! The temperature was in the mid-30's and we were all dressed appropriately,having been veteran's of late night station gatherings before, and passed the time talking and telling stories. Finally around 1 am we heard faint whistling in the distance then suddenly the radio sprang to life and gave the read out from the Spellman Rd. detector at mileage 173. A few minutes later we could hear the engineer laying on the horn coming through town, and at 1:09 am she came into view, with the CP 2246 in the lead, a locomotive that started life as a GP9 in the 1950's and now rebuilt as part of a new class of modern road switchers, GP20ECO, and for several years has had the honor of pulling one of the Holiday Trains. 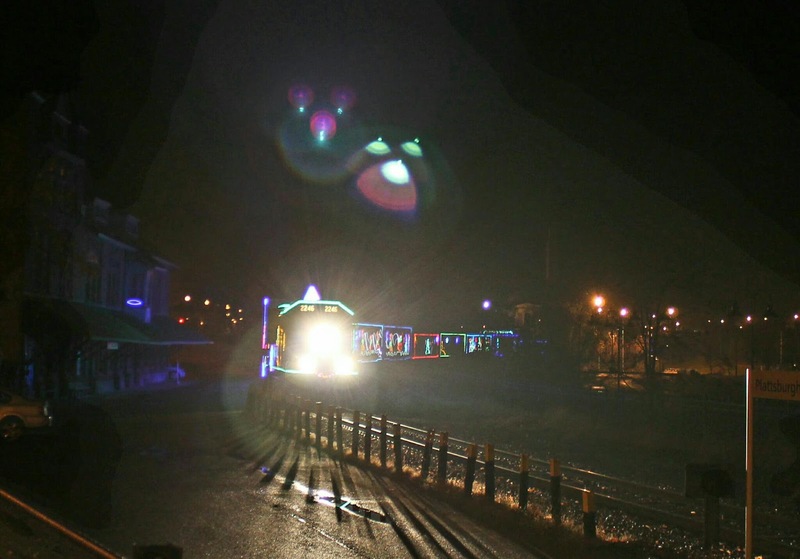 The Holiday Train came and went in mere seconds, but glancing on that dazzling array of lights, you can't help but being struck in a daze of awe. 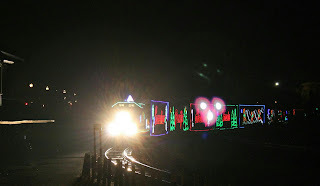 I hope everyone gets to see the Holiday Train at least once. Remember to bring a donation for your local food shelf when you go! Thanks Canadian Pacific! And safe travels to the crews and performers! And good luck to the dispatchers that keep it on its tight schedule and the maintenance of way workers that keep the tracks safe and open for its journey!!! people travel in the CP office cars. 6/10/2016 A work train with Herzog ballast cars is headed South out of Rouses Pt. with leased SD40-2 power of interesting heritage crossing the Leggett Rd. We are well into June at this point and my railfanning has taken something of a slump. Nothing in particular, just time, and when the trains have been running. I don't know when the big tie work is supposed to start, however we were given a real treat a few days ago when a Herzog ballast train came through. It was Saturday June 10. It was a a day when there was a Southbound 930, and they were waiting in Rouses Pt. The ballast train was working up from Plattsburgh and ended up parking just across from Leggett Rd. It was neat since we got to see the 930 take off, then the work train ran the power around so they could go South. Word is the cars are destined to head over to Vermont to get refilled with ballast. A few days earlier on the 7th had a nice opportunity to have a local rail fan get together. Some friends came back to town to visit and it was an excuse to have some of us local train buffs hang out. After a nice dinner in town at Mickey's, for track side dining. Then to hang out for a little by the historic 1886 Delaware & Hudson train station for a lovely evening. 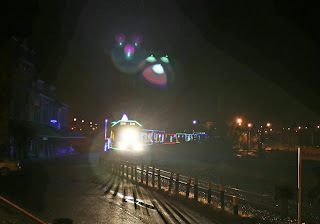 We were rewarded by the end of the night at about 9:30 pm when a Southbound CP 650 ethanol train rumbled by our merry band. 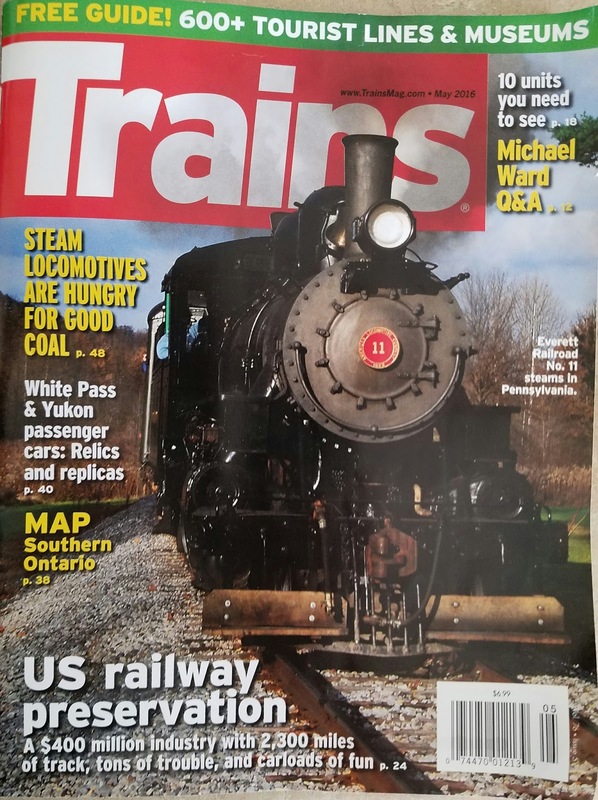 In other news Trains magazine from Kalmbach Publishing gave some nice coverage of the plight of the Adirondack Scenic Railroad, and the greedy trail group that has been coveting the railroad right of way. It was a nice article, with coverage of the dastardly acts by the city of Kingston and Ulster county against the Catskill Mountain Railroad. It is a sad state that the rails to trails conservancy, that started with such lofty goals, has become a childish, predatory monster, seeking out historic and preservation railroads as easy marks. This decision on the CMRR and the Adirondack Scenic will have potential long term ramifications when it comes to any preservation or short line railroad that operates on any government owned track. I did enjoy getting to point out that on the Kalmbach map they got he railroad wrong, they show the line connecting the former Chateaugauy branch going from Lake Placid to Westport, which is completely wrong. It should break off from North or Saranac Lake, and circle North to come in near Plattsburgh. A little criticism I had of the article was that all the Adirondack Scenic pictures were of trains operating on the South end, which is currently not in danger of being lost. Anyway the added exposure is nice, hopefully it will reach a wider audience as to what has been going on in New York. June 6, 2016 and a Northbound NS/CN manifest freight 931 passes through the Canadian Pacific defect detector at MP 173.3 in Beekmantown, NY. Well I have really been wanting to get some posts up, but found time has not been my ally. It has been difficult catching things running when I am out since they rearranged the schedule mostly overnight to accomodate the extra maintenance going on. 4/24/2016 Maintenance equipment congregate near the Terry Gordon Bike path in Plattsburgh during a busy work day on the railroad. For the last couple months now it has been a maintenance blitz. They have been replacing rails dropping piles of ballast and ties for the various projects. We have seen upwards of 40 Canadian Pacific maintenance of way workers on the move. Which as an aside is money being pumped into the local economy as these workers are put up in area hotels, fed at area restaurants and buy supplies at area stores. Much less the amount of fuel, supplies and various items the railroad buys locally to support the operation. The rail gang has been moving South, I have spotted their line of equipment down at Westport, Port Henry and the last place someone I knew spotted it was on the maintenance siding in Ticonderoga. I would imagine it is all tucked away somewhere down by Whitehall at least by now. But the next chore to get done is to replace ties. During the last week someone has been through marking ties to be replaced with fluorescent paint. I first noticed it down by the D&H Station in Plattsburgh on Friday. 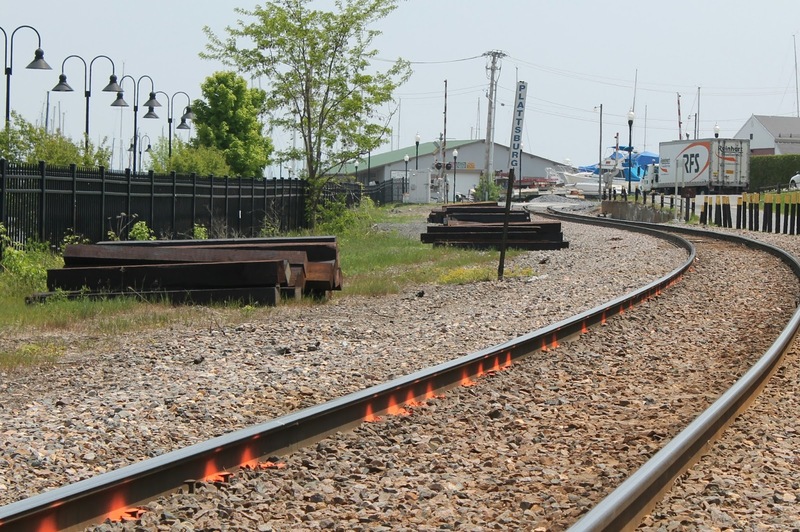 5/27/2016 Bright paint marks raroad ties tof be replaced while the new ties sit waiting to be utilized near Dock St. in Plattsburgh. I am hoping to see some of the tie gang in action like I got to witness the rail gang. All this extra work going on is in addition to the regular maintenance. Coincidentally all this going on happens while there have been protests around the country with sit ins that have involved arrests. In the meantime the local paper has lambasted the railroad for the dangers of the cargo they haul. I would love to be able to interview someone from Canadian Pacific about the infrastructure projects they have worked on. It is always great to see the work that goes into the line, and encouraging that they invest in the railroad to make it safe and efficient. With all this going on for maintenance, it has reduced the amount of trains I've been able to see, with most running before I can see them in the morning. Overnight if I have a window open, I can sometimes here when traffic comes through, and if you can hear the whistle pattern enough, tell if it is a Northbound or Southbound. Of note lately was the appearance of Amtrak 184 the heritage Phase IV and AMTK 822 the Phase III locomotive bouncing back and forth on the Adirondack, including a few days where they met. Two Canadian Army tanks returning from the Sullivan Cup at Fort Benning, GA came back on 931 North. I chased them the day they went South back in March in 930. I saw a 930 at Burke Rd. in Beekmantown that had stopped after getting a stuck brake alarm by the detector near Spellman Rd. the crew inspected the brake and when it was clear they continued on their way. And just a few days ago the local engine changed to the 7307, which is odd since the Bombardier test facility looks full of cars. Well this has been a long time coming, but just haven't had a lot of time to update. 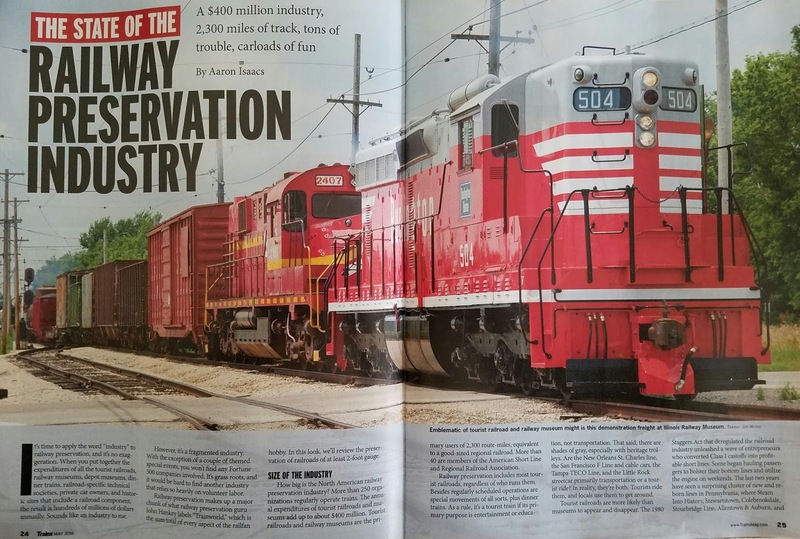 5/9/2016 A fantastic article in the May/June issue of Kalmbach Publishing's Trains magazine highlighting the importance and value of the preservation railroad industry, yes industry. I think this is pertinent up here because of the brutal assault faced by rail historical preservation groups in New York at the hands of “trail zealots” who covet the right of ways and want nothing more than to murder the historic preservation railroads that use them, like the Adirondack Scenic Railroad and the Catskill Mountain railroad. To justify their personal outdoor playgrounds these hobbyist groups have been using the buzzword “underutilized” and horrifically mutilated the Rails-to-Trails conservancy into a railway gobbling monster, bullying communities and picking on volunteer operated non-profit historical themed organizations. One group I've seen posting on the internet has resorted to name calling and routinely uses the kind of insults and derogatory slurs when talking about the rail enthusiasts and historical preservationists would make a libel lawyer dance gleefully with wads of cash clenched tightly between their fists. Sadly for those trudging away trying to make a preservation railroad operate what is underrepresented is the continued growth and interest in the industry. This is what makes Aaron Isaacs' article “The State of the Railway Preservation Industry” so welcome and wonderful. 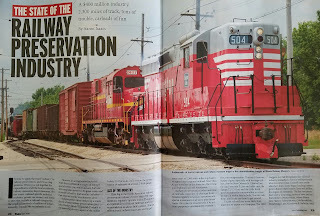 The article is a fantastic read, he opens stating that “It's time to apply the word 'industry' to railway preservation and it's no exaggeration.” Combining tourist railroads, museums, restored depots, private car owners and historical societies he asserts is a $400 million industry. “It's grass roots, and it would be hard to find another industry that relies so heavily on volunteers labor.” The last few years has seen 6 reborn tourist line just Pennsylvania, with more appearing throughout North America that he lists. However despite the interest and growth of the preservation railway industry “a major setback to funding for big ticket items, in 2012 Congress gutted the Transportation Enhancement grant program that began in 1991 and had channeled an estimated $626 million to railway preservation” which was important for places like Spencer, NC, home to the largest preserved roundhouse and host to several extremely popular events. He also lists several other valuable sources that have been drying up like the “MAP-21 federal transportation law that cut overall funding for Transportation enhancement-type projects” these are huge losses for operations that welcome millions of every year, including the “40 railroads and museums” that host Day Out With Thomas events alone “roughly a million people attend” according to Isaacs, and plus there are the Polar Expresses, Easter Bunny trains, Halloween trains and regular season runs. The interest keeps building and the projects keep getting done despite the negativity from special interest groups. 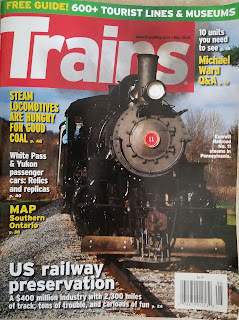 “The last two years have seen the completed restorations on a dozen steam locomotives, five diesels, 12 passenger cars, 10 freight or non-revenue cars, and 10 street cars, plus at least 12 new or restored buildings and four major track projects.” there is a great amount of interest in this history and they can really pack the people in to experience it. This is why I cannot understand why New York State and these special interest lobby groups are so obsessed with destroying what we have. One local historical preservation railroad has suffered for years with empty promises of state backing on several large projects that never materialized, leaving it in the position it is now, fighting for it's very survival. This wouldn't have been a problem nor the trail group that hounds it had the state followed through on their original intentions. A historic preservation railroad is not just a train ride, or a special interest, it adds a wonderful attraction and increases the diversity of an area's tourist draw. Isaacs mentions “it happens that between the ages of 2 and 6, kids go crazy for big mechanical things that move” and scenic train rides are a great way for a family to experience an area and learn about local history. Most preservation railroads utilize historic and vintage equipment, like the Adirondack Scenic railroads 6076, while an operating GP9 is not entirely rare, a 1959 GP9 with a 'F' emblazoned on the end of the long hood and control stand to match with a proud high short hood is something you don't see anymore. With that locomotive you get eager volunteers, ready to answer your questions and explain what makes a particular piece of equipment special. These are the kind of operations you can get a good look at how a railroad functions, ask questions and see how a big horsepower diesel locomotive runs and people happy to show you. Historic preservation railways offer a great insight to local history as well as providing a fun family friendly activity and you may not realize how much you learn. Railroads were important to the everyday lives of just a generation or two ago and I'll break down just a small segment of the Adirondack Scenic Railroad for example. On a ten mile stretch of rail line between Lake Placid and Saranac Lake, NY there were 16 businesses and industries that utilized the railroad directly. The railroad fell under the New York Central and Delaware & Hudson Railroad as well as under different names. It supported 2 Winter Olympics in Lake Placid in 1932 and 1980, providing most of the transportation in and out during the earlier games. In fact in 1932 snow had to be transported to Lake Placid in freight cars for some events due to a mild winter! The railroad saved millions by transporting people out of the cities into the clean mountain air of Saranac Lake for respite from Tuberculosis. Presidents and important actors rode the train, and Lake Placid and the Adirondacks (famous style chair included) wouldn't be the tourist destination it is today without the railroad. Today you can take a train from either Lake Placid or Saranac Lake riding in classic 1950's passenger coaches behind a 1950's locomotive and learn wonderful anecdotes and history first hand while talking to the all volunteer crew in a unique setting. However this endearing scene of Americana is endangered by a group of trail zealots, 2016 is to be the final season of 34 miles of the Adirondack Scenic Railroad between Tupper Lake and Lake Placid. Despite the broken promises of state support, despite plans for rails-with-trails solutions that the state and trail groups dismissed out of hand despite successful “Steam Into History” and Western Maryland Scenic combined rails-with-trails outfits, despite what Isaacs says that “The industry is growing and in good shape, largely because so many people want it to happen. There are challenges, but also much forward momentum.” Recent decisions by NYS turns its back on all this with the DOT, DEC and Adirondack Park Agency collaborating in the state sponsored killing of a treasured piece of history that affected the lives of millions of people, where thousands of visitors annually make family memories, is now turning its back on part of a $400 million industry with increasing interest and growth for the lofty goal of spending millions of taxpayer money to create a nice space for your dog to go poop. Maybe if more articles like this had been written and published the trail lobby wouldn't have as much ground the last few years. I am glad there is someone out there talking about the good parts of railway preservation and I hope Aaron Isaacs message gets around much farther, because it is a wonderful relief and very encouraging news. What do D&H Lightning Stripe and BART Have in Common? Canadian Pacific 7304 in D&H Lightning Stripe shoots out of the Bluff control point shortly after 8 am heading North on May 5. 5/4/2016 So I did some "Railroad Rambling" this morning. I have been busy and haven't had much time for railfanning lately, time and hobbies, all in balance. However I had an itch, and the cure, more cowbell... err, nope, something big with a powerful prime mover about 2,000 HP and capable of about 61,000 lbs of tractive effort. Turns out that was easy to get. After making the Sunset Ave. crossing D&H 7304 proceeds North heading into Plattsburgh on its way as Canadian Pacific local D11 going to Rouses Pt. While trolling around the base I saw the D&H 7304 at the Canadian Pacific office, resplendent in her Lightning Stripe. 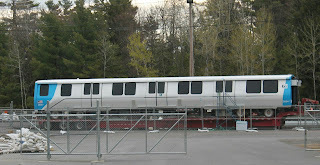 Unfortunately it wasn't doing anything yet, however I did get to see one of the San Francisco Bay Area Rapid Transit (BART) cars packaged up, ready to go. This car is about to take a cross country tractor trailer trip. There's no shipping these by rail conventionally as BART atypically use broad or "Indian Gauge" at 5'6" as opposed to 4'8 1/2" standard gauge. I've heard several explanations for this, the more official being that the wider gauge was supposed to be more stable in a seismically active area, the more unofficial reason is that by being different than any nearby freight railroads, and therefore all equipment is incompatible. However being different makes BART equipment and trackage more expensive and obviously makes shipping a car on it's own trucks cross country impossible. This has been my first look at any BART equipment, so I think it was cool. After sightseeing the Bay Area from the luxury of Plattsburgh I heard on the radio 7304 as Plattsburgh local D11 had to make a run up to Rouses Pt. and make a pick up at Champlain Plastics. This was my opportunity to make a catch I've desired, at a crossing I haven't been to since winter set in, a little side street called Sunset Ave. Arriving at Sunset Ave. I was caught off guard as the 7304 made better time than I anticipated, she was coming hot out of the control point at 165. It was only a minute after 8 am, and I was not disappointed. 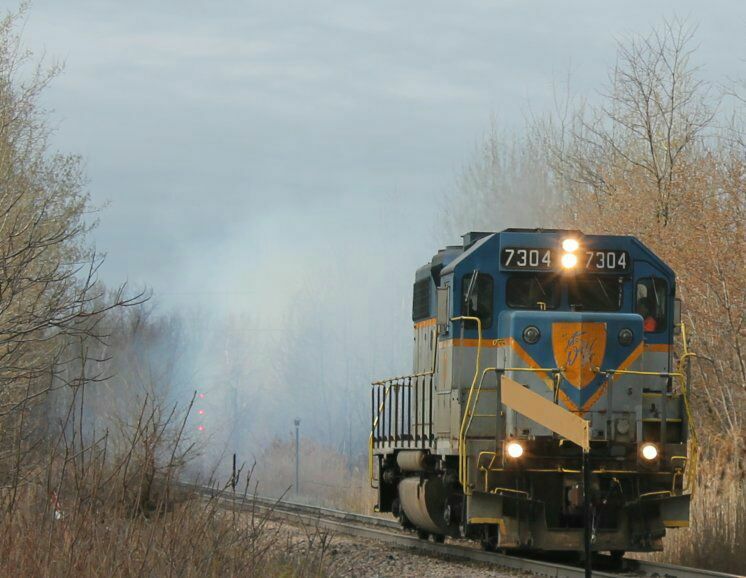 Coming up the tracks was 7304 running light power, pouring out an impressive amount of exhaust. She left a nice cloud and was working for the title of "honorary ALCO"
I certainly would have enjoyed a nice chase to Rouses Point, but time not entirely being on my side I abstained. However I was completely happy with my catch, and even had the excuse to make a HeritageUnits.com report. 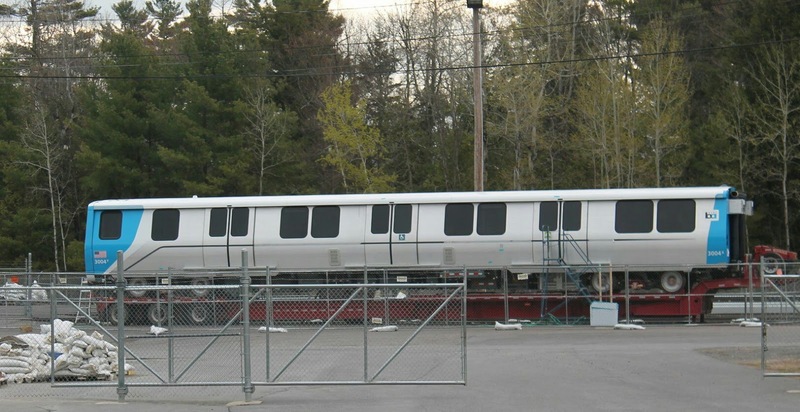 A Bay Area Rapid Transit car appears ready to ship out from Bombardier Transportation in Plattsburgh, NY on May 5. Canadian Pacific maintenance crews replace rail in West Chazy New York on April 25, 2016. This is part of the ongoing maintenance invested on the D&H North End mainline on a regular basis. On April 24, 2016 Norfolk Southern/Canadian National train 930 a manifest freight connected Montreal, QC to Harrisburg, PA waits in Rouses Pt. NY for a Canadian Pacific crew to take it South to Albany where it will get handed off to an NS crew. Well here I am on a gorgeous weekend at the end of April. 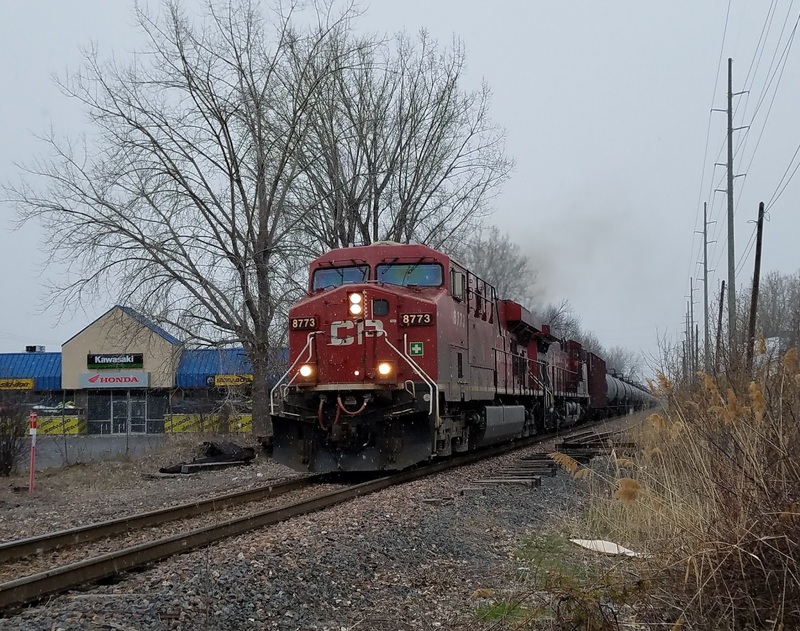 The last week or so has been banner for seeing the efforts of Canadian Pacific Maintenance of Way workers on the Canadian Pacific D&H North End around the Plattsburgh, NY area. I have spent a lot of time taking photographs and filming the heroic efforts if these skilled artisans practicing their trade. This brings me to the subject at hand: time. Always a sticky wicket for most people. For me lately has been trying, balancing work, family, girlfriend, trains and volunteering. Things are ramping up on the railroad and I've been trying to sneak out there and do what I can for work. I have been getting a backlog of photos and especially video which has been impossible to keep ahead of. Video takes a lot of time to do putting in captions and information. Since Monday I have a lot of fascinating pictures and video of the maintenance workers in the area in both West Chazy and Plattsburgh. At least for day to day sightings I have been able to keep Facebook up to date. So everything in moderation I guess is the key. Definitely not get stressed out by hobbies, and prioritize effectively. As of late the railroad has been busy with maintenance so daytime trains have been intermittent, so I have a chance to catch up on some of backlog. 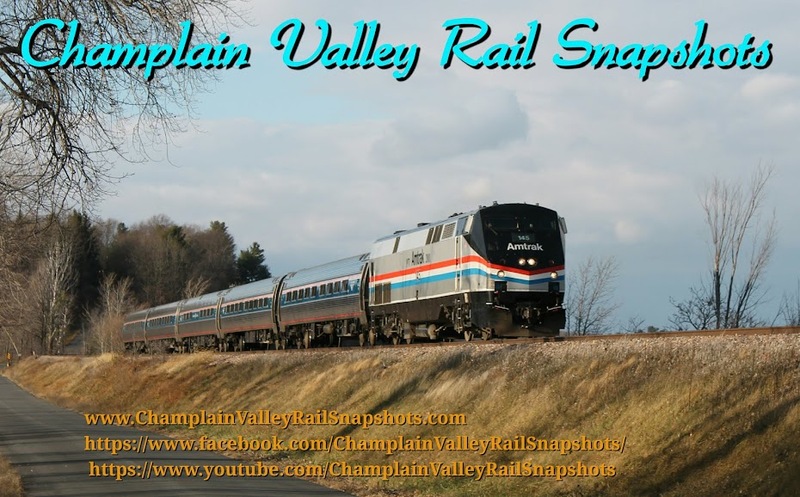 In the end running Champlain Valley Rail Snapshots has been a very rewarding experience and I have met so many people and made a lot of wonderful memories. On April 21, 2016 Amtrak 68 the Adirondack flies South past the old D&H Station in West Chazy. Today May 1, 2016 marks the 45th anniversary since the formation of Amtrak which was to take over the burden of passenger service from the ailing freight carriers. Trains, Not Planes or Automobiles... Really Just Trains! 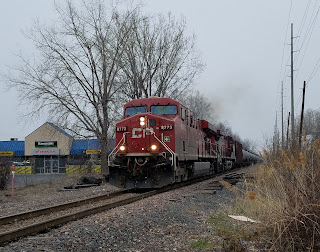 Canadian Pacific Southbound train 650 enters the edge of Plattsburgh, NY on 4/26/2016 at 7:20 am with 2 GE locomotives and a load of Ethanol destined for Albany. Howdy! Weclome to Champlain Valley Rail Snapshots and our new venue! So when I started this, whatever it is, I had no idea where it would go. I first started the Facebook page as a way to keep the train stuff from clogging my personal page, then I made a Youtube channel to keep trains from clogging up my personal channel. In the last year it has grown in popularity and I have met some wonderful people and shared some great experiences railfanning along the way. I have had a life long love of history, and come by the fascination with trains honestly. My father is a life long train buff, and his father spent over twenty years working as a dispatcher for the Pennsylvania Railroad and the Western Maryland Railroad and loved trains. I got into trains as a distraction when I got divorced, and enjoyed the history, heritage and the amazing achievement that is the modern railroad. I have learned many wonderful things about the railroad along the way and the joy my son loves seeing the big trains as well as the usual Thomas the Tank Engine and Friends. I am a big supporter of tourist and scenic railroads that are unique experiences for people in a world today where the train dozen factor into our day to day life as it did a couple generations ago. Even today the railroads affect our daily lives because of the raw materials, automobiles, manufactured goods, and fuel carried today. I have gotten some first hand experience volunteering for a couple seasons on the Adirondack Scenic Railroad, and getting to watch what a small operation like the Saratoga and North Creek have to go through to survive. 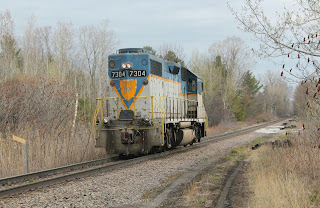 You can see more of my daily adventures by finding Champlain Valley Rail Snapshots, and check out some of my Youtube videos. So join on some of my adventures, I hope to hear from other railroad enthusiasts along the way. I am interested in trains and local history, I have traveled the Northeast as a historical reenactor for over a decade. I got the train bug and became interested in the history and heritage of the "iron road" Now I travel around watching the modern rail industry at work and meeting other railfans along the trail. The railroad is an amazing achievement from the early horse drawn edgeways and plate ways of the 18th century as an integral part of the Industrial Revolution, changing the way economies work and wars were fought, into the ultra-high tech high horsepower behemoths that exist today. 2016 Champlain Valley Rail Snapshots. Picture Window theme. Powered by Blogger.